Suan Son Pradipaht or Sea Pine Tree Garden is located in a military camp about 9km south of Hua Hin. This beach has long been accepted as one of the most popular beaches in Hua Hin. Belonging to the Army Welfare office, the beach is open from around 5.30 am until midnight. Suan Son Beach is located within easy reach. It is at Km. 241 on Petchkasem Rd. only 9km from the centre of Hua Hin. You can take Tuk-Tuk, Songtaew, motorbike or your own vehicle. There is a low entrance fee of 10 baht for motorbikes, 20 baht for cars and 40-80 baht for buses (depending on the size). Go get refreshed at this famous beach, relax and enjoy the view of this beautiful beachside area. It can be assured that it is the best way to spend any of your free days. This amazing beach in Hua Hin gives you a glimpse of genuine Thai beach life. It is one of the places you might want to consider, when escaping from the commercial tourism. Suan Son Beach was officially opened to the public as a tourist destination at the end of 2001. 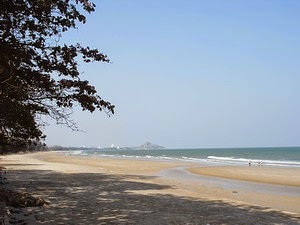 The beach is very good for swimming and other beach activities, with fewer rocks than there are at Hua Hin main beach. The remarkable feature of this beach, as the name suggests, is the Sea Pine trees (Son) that grow in rows giving an orderly look. These Pine trees provide adequate shade for one to sit and relax while admiring the beauty of nature, cool sea breeze touching one's face calmly. The vast area of Suan Son Beach makes it possible for various kinds of group activities such as football, which always is an almost permanent feature of this beach. Taking a walk on the white powdery sand along this beach is another almost certain thing one would to coming to this beach in Hua Hin. Another reason why people keep coming to this Suan Son Beach is because of the variety of accommodation that is available here. Hotels and bungalows with required facilities in this delightful atmosphere is the ideal place to spend your time. You have a wide range of types and price of the room you want to stay in. The price of hotel rooms ranges between 1,600 baht to 7,000 baht per night for general people. As for bungalows, the price ranges from 1,800 baht to 3,400 baht. Get full rest in these well-maintained accommodations at Suan Son Beach and rejuvenate yourself, receive the fresh and cheerful feeling nature will provide. Though Suan Son Beach is billed as one of the most popular beaches in Hua Hin where people prefer to pay a visit and spend their time, it retains its beauty and freshness perfectly well. One major advantage of this place is the soldiers belonging to the military camp who take care of the place, so the tourists and the guests who stay in the area will feel safe. You may even take a tour around this spacious camp to get a better idea and feel of the place. The well-laid garden is another attractive element here. Various restaurants serve a wide variety of food at reasonable prices. Be happy and relaxed to the full extent, on the sandy beach that virtually connects to Khao Tao which is some 3 kilometers to the south. The sparkling sea in the front, Khao Tao on your right, Khao Takiab on your left is one of the rare views you can have only here -the Suan Son Beach.